Hi everyone, I wanted to share my editor IDE setup and config files using neovim and zsh on ubuntu gnome 16.04. Neovim is awesome! Have you used other editors / IDEs? If so, why do you prefer Neovim? 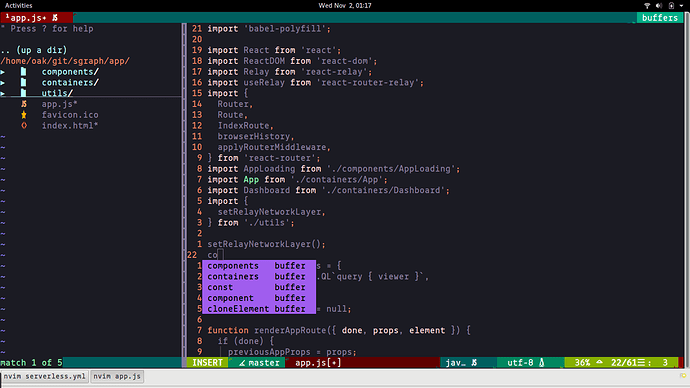 Yes, I used to use atom but realized the power of vim (neovim) was with the keybindings and modes I was able to appear and edit documents exactly where I intended to. Also complete customization down to every keystroke and modularity with plugins. In comparison to vim, neovim has asynchronous job control and is low on resources among other benefits. Thanks! That sounds great! I will try it today.